The Bowen Technique is a hands on body therapy based on gentle moves over muscles, ligaments, tendons and soft tissue. The gentle treatment for a wide range of conditions. Thomas Bowen of Geelong Australia developed his own “technique” and had a thriving practice until he died in the 1980s. His approach is now known and used throughout the world. The Bowen Technique is a therapy that aims to balance the whole person and not just the symptoms. 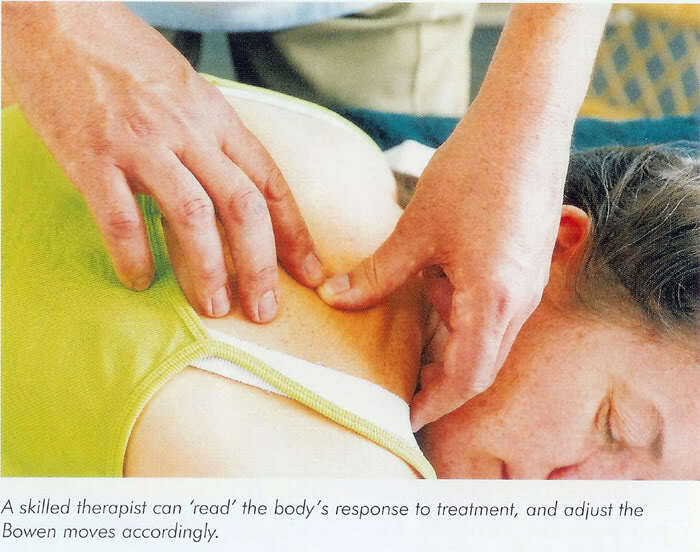 The therapist uses thumbs fingers and hands to make gentle moves over the muscles tendons and ligaments. An important part of the treatment process includes a series of short breaks where the client rests and allows the body to respond to the moves that have been made. re-balance of the body that helps in the relief if the tension and the reduction in pain. It is these features that make the Bowen Technique so unique. An appointment will take approximately 45 minutes. A response is usually noticed within 2-3 weekly treatments, however, some longer term conditions may require further treatment to achieve long lasting relief. The Bowen Technique helps to improve circulation, joint mobility, posture and alignments, lymphatic drainage and alleviates stress. It aids the elimination of toxins. The whole body is treated both chronic and acute conditions can be addressed. Infant Colic, PMT and many more conditions.